The Electric Chair is the best hair salon in San Diego. The Electric Chair has the best hair stylists in Ocean Beach. Get your hair dyed and colored at an OCean Beach salon and hair style shop. Get your hair styled at The Eelctric Chair in Ocean Beach. Get your haircut at a hair salon in Ocean Beach. 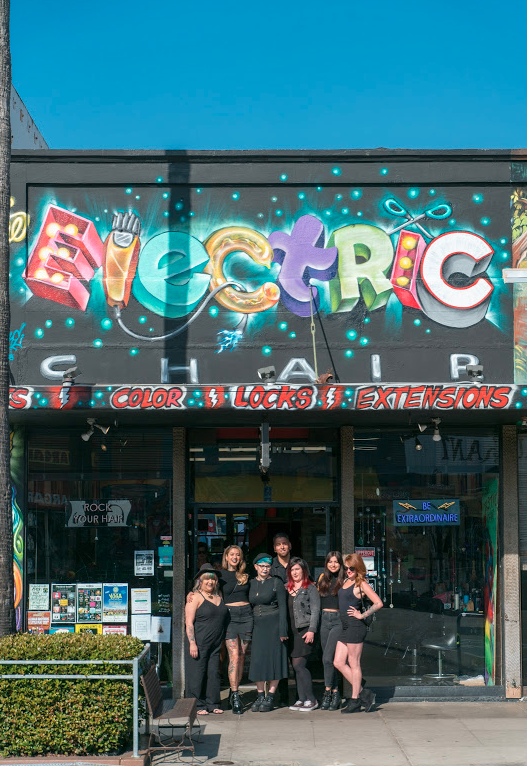 The Electric Chair is an award winning, legendary salon and gallery in the heart of Ocean Beach established in 1984. We aim to serve the community with the best of class in dreads, precision cuts, and color. We do it all methodically, while being surrounded by music and masterful art. We strive to be Technical, Ethical, Cutting-edge. Our team of devoted artists coupled with mindfulness for client care are the foundation of The Electric Chair… Where Hair Meets Art. TEC on the cutting edge, where hair meets art. 15% OFF Military Discount: We honor all those who serve and their families. We offer a variety of hair salon services, including vivid hair color, dreadlocks, hair color correction, hair extensions, patterned undercuts, edgy cuts, and more. If you’re interested in scheduling a free consultation or booking an appointment with one of our hair stylists, contact The Electric Chair hair salon in Ocean Beach today. Give us a call at (619) 223-1112 or fill out our online form.